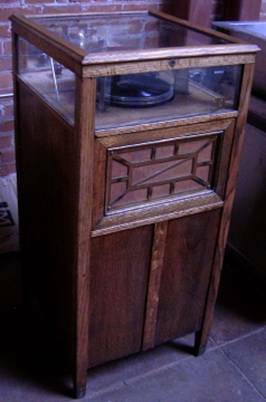 The Deca-Disc is a small upright phonograph with a case made from plain quartersawn oak and a glass top. A small grille in front is the horn/ loudspeaker opening. The five 10” records sit on three supports above the turntable. The coin-op mechanism with an accumulator function allows prepaying multiple records. The phonograph is powered via a belt by a small electric motor, which drives both the turntable and the mechanism via a clutch arrangement. The turntable is made of lightweight aluminum to minimize the load placed on the changer mechanism with a full stack of records, allowing for use of a very small and inexpensive motor. The low mass of the turntable and corresponding lack of inertia necessitates an overly complex governor to maintain speed. The motor is somewhat underpowered and is managed with a curious governor arrangement: At start-up or when the resistance of activating the changer mechanism lowers the speed, the governor activates a switch which sends more current to the motor. 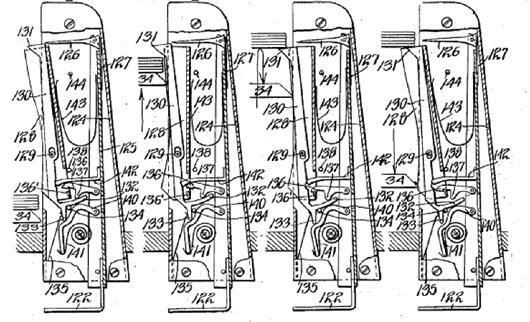 To regulate constant playing speed, the governor uses a second switch to interrupt the motor circuit. The curious blue “mood lamp” at the back of the phonograph assists the owner to regulate the governor with the top-mounted speed control: Correct speed is reached when the light flickers steadily during play. Despite this somewhat cumbersome governor arrangement, the lightweight turntable runs smoothly without wow and flutter. When a coin is inserted, the record starts spinning. At the end of the record, the sophisticated trip mechanism activates on any kind of run-off groove: Victor elliptic, Brunswick/ Gennett spiral, or no run-off groove at all (e.g. Columbia). This is achieved by an ingenious worm gear and nut device, which follows the tone arm, and checks on the speed of tonearm movement (see left upper corner in photo above). When there is a difference between the follower and the tone arm movement (either the tone arm moves fast in the run-off groove, or does not move at all), the nut jumps out of the worm gear and activates a clutch, thus starting the changer mechanism. This is the most sophisticated automatic trip, which for the first time solved the problem of working with all records regardless of manufacture and run-off groove design. To my knowledge, only some Swedish LUXOR changers of the 1940s ever employed a similar device. 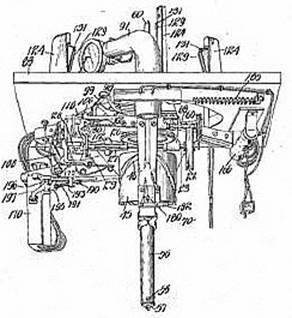 The design of the turntable lift mechanism is of simple elegance, but is compromised by the weak electric motor: The whole lift cycle is actuated by a large vertical cylinder, where a helical groove moves the platter upwards and downwards with the help of a pin on the central axle. Regardless of the cycle (pick-up vs. replenish cycle), the turntable always moves the same way. In the reload cycle, the platter goes all the way up and deposits the stack of records above the catches. In a record drop cycle, the separator knifes prevent the platter from rising above the bottom of the stack forcing the turntable to slip a few threads further down on its central threaded shaft. It uses a multiply-threaded pawl that can ratchet easily to accomplish this. A cam on the main cylinder also adjusts the playing surface lower for each additional record. This underpowered motor is a major weakness of the Deca Disc: It is unable to lift more than the weight of 5 records. Had Deca-Disc chosen a stronger spring and a larger motor, the changer could have handled more than the limited selection of only 5 records. The rising turntable pushes the three main catches aside. A complex linkage inserts three separator knifes between the bottom and the second record. As the catches further retreat, the bottom record drops on the turntable. 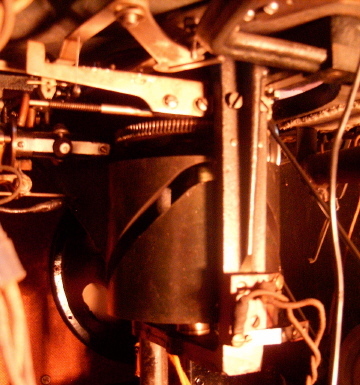 Inside the support posts, a mechanical sensor recognizes an empty magazine and retracts the separator knifes, allowing the turntable to restack the magazine during the reload cycle. While the Deca-Disc is a reliable mechanism that will play and change records securely and with no damage, the spring-balanced mechanism and weak single motor are difficult to adjust. The limit to 5 records is a major disadvantage. Modified by Ristau Atlas Sales Co. I am always interested to hear about other machines. Again my great thanks to Chuck Azzalina for his great help in creating these pages. Pleases check out his other web pages with even more fascinating early audio and TV tube electronics. One level above this page, you can find more fascinating changers with video clips.